J.T. 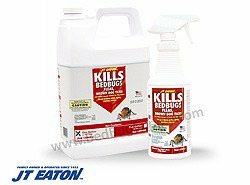 Eaton Kills Bed Bugs II (residual). Can be used for a variety of bedbug harborage areas, including wall joints, baseboards, behind and underneath furniture,, etc. J.T Eaton Blue Contact killer works in conjunction with J.T. Eaton Bed Bug Killer (contact killer) and Powder to effectively kill off bed bug infestations. We really like the illustration below showing exactly where to use each of the J.T. Eaton products along with the demonstration video, which makes treatment application easy to do yourself. Along with using the application example of a bedroom below for the J.T. Eaton bed bug products, scan the room looking for places bed bugs could be hiding. 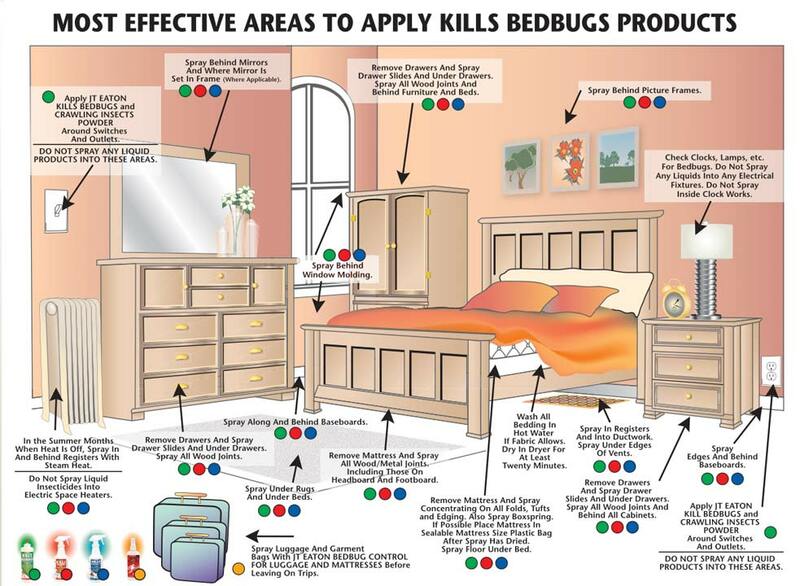 Remember bed bugs normally preside within 5 feet of the bed so be very thorough in your application of the residual spray in order to hit all the areas bed bugs may be hiding. Always read and adhere to the instructions on the product's label to ensure proper and safe usage. 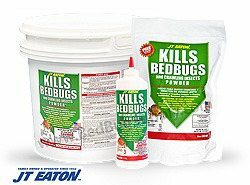 JT Eaton Kills Bed Bugs II is a very popular water based contact kills that uses active ingredient deltamethrin to quickly knockdown a bed bug population during initial and follow up treatments. We have been offering this spray for 3 years now and have had great results and received very positive feedback from our customers. It has almost no smell and can be easily applied with no mixing inside cracks and crevices (comes ready to spray). Also, given its a water-based spray, it dries fast and will not stain water safe items. It's active ingredient is a synthetic pyrethroid called deltamethrin, which is one of the most popular insecticides used worldwide. JT Eaton Kills Bed Bug II works as part of a cocktail approach in conjunction with JT Eatons Bed Bug Killer (red bottle) and JT Eatons Bed Bug Powder (green bottle) and Bedlam Plus (residual) to effectively wipe out bed bugs with deadly precision (always review and follow the bottles label and directions). 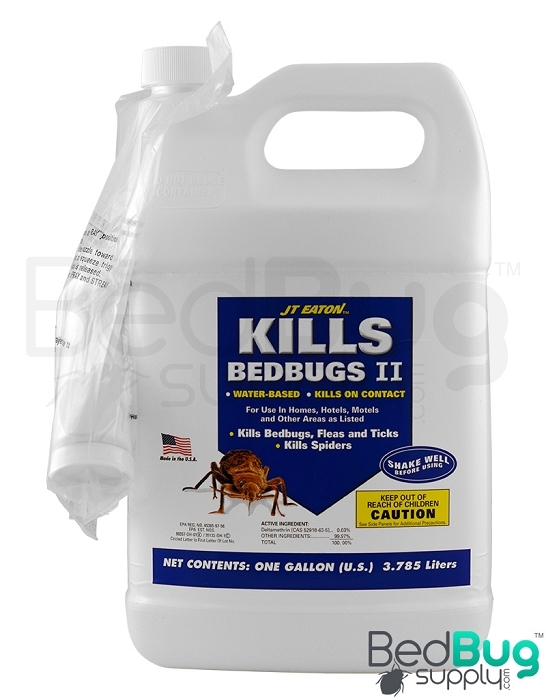 JT Eaton's Bed Bug Killer II (blue bottle) is used on day one of treatment after the Red Bottle of contact killer is applied and before the Green Bottle of diatomaceous earth has been put down. The blue bottle should be applied in cracks and crevices including behind hanging wall frames, below drawers, on baseboards, etc (areas that do not come into contact with your skin). (please see our video above and application illustration below). Repeat application every 2 weeks for 6 weeks to complete the bed bug treatment protocol. Before applying any of the JT. Eaton bed bug products, we recommend using a Professional Bed Bug Steamer on the edges of the room and inside cracks and crevices (allow to dry for one hour or until fully dry). If you have any questions please call us at (866) 238-9868. Q: Does the blue label BedBug Killer II have a residual effect. If so, how long . Is it safe to use on items that people come in contact with? JT Eaton II is a residual spray, and will remain effective for up to 2 weeks. It's safe for use on items that people will touch, provided that that surface is included in the product label, and has been given time to dry after being sprayed. Q: Do I have to leave the comfort of my home when I use this spray? No, you won't need to leave your home. Just make sure that you follow the product label and MSDS to ensure safe and effective usage. Q: under products which in bulk item is a residual instead of contact, i don't want to use aerosol cans but i want a residual product so which one of the liquids is residual? J.T. Eaton Bed Bug II Spray is a contact spray so it will not offer any residual protection. Aerosols are actually very good for bed bugs and offer a great residual. 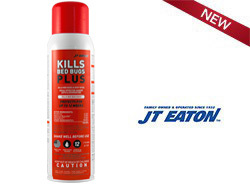 Take a look at JT Eaton Kills Bed Bugs Plus, which offers a 12 week residual (also available on our site). Hope this helps! Q: does the JT Eaton Kills Bed Bugs II kill the eggs also? The residual effect of JT Eaton II doesn't last enough to reliably kill bed bug eggs. For eggs, you would want to use a residual aerosol like JT Eaton Kills Bed Bugs Plus. Q: I was wanting to know if this is safe to use around children and pets seeing as i have a child and a cat? The product is safe as long as it's fully dry before the children and pets re-enter the treated rooms. It's hard to say how long this would take given variables in temperature and humidity. My best guess would be 6-8 hours. Be sure to apply only in cracks and crevices, which will not come into contact with your pets or your skin. I just moved to a new apartment complex only to find out that the building has bed bugs. Yuck! I tried the jt eatons red labeled spray that is oil based. *wow works great* The blue water based spray worked just as great!! Both sprays did as labeled and killed on contact then kept the bugs away. Reviewed by: Brittany from Texas. Reviewed by: james d. hanna from reno. I have purchased this product twice from this company. The price with free shipping cannot be beat. Fast. Why twice? To keep things under control! I am down to inspecting once a month and retreating with this product at the smallest sign the bugs are back. Nice thing is this kills spiders and fleas, too. So it's a good household treatment. Sprayer came with the 1gallon size -GREAT. I didn't expect that. (Due to stigma associated-I have withheld my real name. Reviewed by: Milli O. from Cincinnati OH. We liked the fact that it's water based and had no smell. This was included in the kit and worked well with the other products. Reviewed by: RICK from MARSHALLTOWN, IA. Kills Bedbugs II works fine, but I've had to spray every room and the hallway in the custodial home where I work at least every other day to keep the bugs down. Not sure how residual it actually is, but it does kill the bugs. We see them at times and most look like they're in bad shape, barely moving. Will continue to use it until somebody comes up with something better. Reviewed by: Britt Meacham from Mobile, AL. didn't notice any smell and didn't see anything after the spray. Good product. Reviewed by: Jacob L from MI. I definitely recommend this product. I used the residual and the dust. Not only am I bite free after 2 weeks, but this stuff also defeated the mass army of spiders (20 of them .____. )that set up shop in my mother's basement. Reviewed by: Shay from Omaha, NE. Works! Isn't that all that matters? Reviewed by: will from Michigan. This product is amazing! It has hardly no odor, and with continuing use -you will notice the bites becoming less and less, and then NO MORE!! Reviewed by: Lynn from North Haven, CT. Reviewed by: Johnson from New York.